My Monthly Hero - March 2018 Card Kit - Hello great friend! Welcome to the Hero Arts "My Monthly Hero March 2018 Card Kit" Blog Hop! As I'm typing this we are in the middle of a giant winter storm! Winter came late this year. But, It's March, and Spring is coming to everyone finally. Time to open up the windows and breathe in some fresh air...and get crafty! I'm happy to be here today launching the newest, latest, greatest MMH Card Kit from Hero Arts! This month's kit has lots of sentiments and beautiful word dies, and ink and embossing powder...lots of things to give you options on your cards. Mix and match the different words with the new dies to create the perfect greeting for any occasion. I used the main kit for my card today and also one of the beautiful background dies. I made a cheerful, friendly coffee card to send to a friend. The color combination is fresh and fun - aqua, red, kraft and black. And...with cream instead of white cardstock. You may have arrived here from Emily's amaaaaazing blog! If you want to start at the beginning of the hop CLICK HERE to go to the Hero Arts Blog. As always, lots of fun and inspiration for you today from my awesome fellow bloggers! I'm always grateful to be included in the Hero Arts lineup! If you're new to my blog today - welcome. Enjoy the hop today! I will always warn you, these kits sell out VERY FAST (usually the first day) so if you like it, don't hesitate! I know I say that every time, but it's true! Get it while you can! They are such a great value! Each kit is $34.99 and this month's kit has a value of $70.00! And here's my coffee card! My card base is A2 size, made from cream cardstock. I used Copic Markers to color the coffee images. 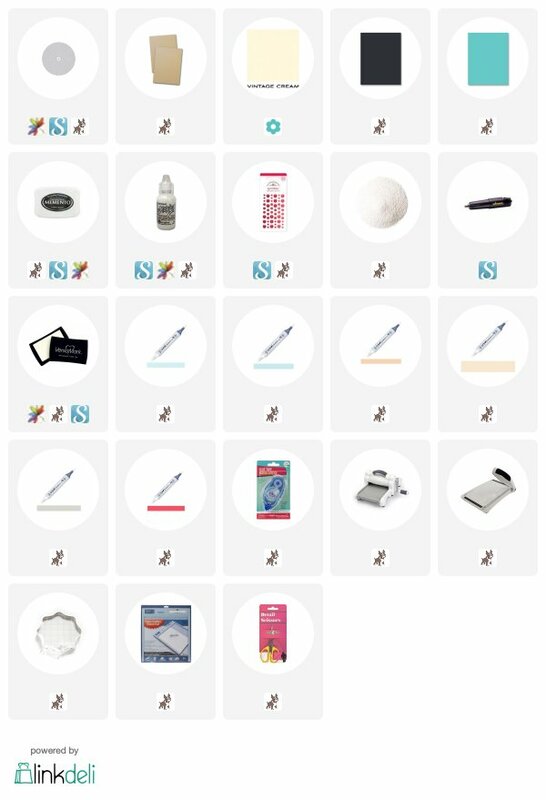 Supplies are listed at the bottom of my post! Cheers! I already love this scripty hello die. It cut out like a dream too. After I made my card base, I layered my favorite color of aqua cardstock onto the card. Then I used the new background die and cut it out of kraft paper. I layered the kraft over a layer of cream paper the same size. These served as my foundation layers. Then I die cut two circles out of the Hero Arts Nesting Circles dies for the focal point layers. I die cut the hello die and the banner die from black cardstock. I stamped and colored the two coffee cups and cut them out by hand. I heat embossed the 'great friend' sentiment with white embossing powder onto the black banner. I added Diamond Stickles to the hearts and the whip cream for some sparkles! To attach the word die, I used a glue pen on the back and then used my tweezers to hold it and place it onto the card. I held it down with my fingers for just a moment until the glue stuck. I like how it layers over everything else! The cups were attached with foam tape. I added a few red enamel dots because I always love a pop of red with aqua! The kit is available NOW! Yippeeeee! This kit is a great value for $34.99! Hero Arts is VERY generous with their beautiful kits! All the supplies I used are listed below in my links! PRIZE ALERT!! Hero Arts is giving away one kit as a prize to one blog reader – selected from the comments across all of the blogs in the hop. Giveaway closes March 11th, at midnight, and the winner will be announced the following week on the Hero Arts Blog. If you've already purchased your kit, and you win, you will be reimbursed. So be sure to leave a comment at each stop on the hop! This kit is available for a limited time only - once it's gone, it's gone! Kits begin shipping from Hero Arts on Friday, March 9th. These kits have a habit of selling out fast! So don't wait if you like this one. The last one sold out the first day! Next up on the blog hop is the super talented Janette! Have fun hopping and have a happy, creative day! XOXO When you make something with your new card kit, be sure to use the hashtag #mymonthlyhero on your social media! TO START AT THE BEGINNING OF THE HOP, CLICK HERE! Thanks for stopping by today! Beautiful layering on this sweet card. Wow I love that card! Just a great combination of things and the color combo is super nice. I love coffee stamps and dies. Great card! Love those coffee cups, and that dreamy Hello sentiment, too! Great cards!! I love your color combo with the coffee stamps. How fun!! I've purchased two HA kits in the past 9 months and they are an incredible deal! This one is super too! I so want that background die too! Wow! I especially love your color combination. It really pops and is gorgeous. Thank you! Great card - that die makes such a wonderful background! Would be a very special card for a special friend. Thanks for sharing ! Loving this color combo and that latticey cover plate in the kraft. Love how the sentiment hangs off the edge of the circle die too! I love your Hero ideas! Thanks for helping make more out of my purchase! I love friendship cards. That is a very nice design you made with this kit. This is such a great kit. Loved your coffee card. Cute card-what a great kit! Beautiful and fun coffee card! Love the amazing coloring and that bold graphic confetti die cut is stunning! Such a lovely card! Really like the die you used for the background - looks like fancy lattice work! Wonderful card using an amazing kit that you could use every day! I love the background die. It's beautiful and can be used so many different kinds of cards or mixed media. Your card is beautiful! I love how you put it together and the different colors. Even though I’m not a coffee or tea drinker, I love your sweet card and I’m sure your friend will be thrilled to receive it. Great combo of colors, too! I’m telling myself I don’t “need” this kit, but I want it. Crossing my fingers for a win! Adorable card! Thanks for the ideas! What a great card. And I love that background die/cover plate. Love the details of the die cuts in this kit! Your cards are beautiful! Wow! Always love your colors. The Kraft cardstock window die cut is a perfect backdrop. Thanks for sharing Wanda! super fun card... love it!! I'm always eager to see what you've created. Cute card, as always! Beautiful card! Love your attention to details on it. I love the colors you used for your card nice and fresh. What a great kit & the add on die you used is drool-worthy. Your card has a fun look to it. Cute card! The new kit is awesome, but I love the add-ons even more! Wonderful card... Love the coffee theme, the colors and the background as well as this kit and add ons! Such wonderful cards! What a great kit! This is a really cute card Wanda! I love the layering and the colors. And who doesn't love a coffee themed card? Great kit! Love seeing the variety of cards made with the new products! Wow!!! What a lovely card!!! Too cute!! !